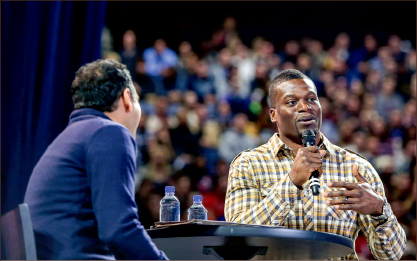 Ben Watson, a tight end for the New Orleans Saints who just finished his 11th season in the NFL, tackled the issues of racism and identity in his appearance at the second Convocation of the semester Friday, Jan. 16. In the question-and-answer-style session, Watson explained that in the NFL, players are constantly judged based on their performances, and it is easy for players to find their meaning in the game of football. “When you’re a believer, that is who you are and your essence,” Watson said. “What you do with your life is simply what you do. You are a Christian. You are a believer. Watson encouraged the audience to find an identity in Christ rather than in any temporary satisfaction. Watson also spoke about his Nov. 25 Facebook post, which has garnered attention from around the nation. The viral post came in the wake of the grand jury decision about the shooting of Michael Brown in Ferguson, Missouri. Once Watson heard the news of the decision in late November as he walked out of the locker room after a Monday Night Football game, he cautiously began to record his thoughts on the incident. According to Watson, it took him approximately one day of writing on and off to craft the post, which puts into words his emotions and the reasons for his reactions. The letter begins with the emotions of anger and frustration and shows a journey to hopefulness and encouragement Watson has found in the gospel message. Though the parts of the post pertaining to sin and salvation have impacted many people, Watson said his decision to include the material was not so simple. The post has been shared nearly 475,000 times, and more than 860,000 people have liked it. Additionally, according to Watson, Facebook personnel had informed him at one point that his post received more than 40 million impressions. In all of the attention the post garnered, Watson said he has been most encouraged by the responses of those in the NFL. “The biggest (encouragement) just came from my teammates saying — whether they’re white, black, young or old, (and) coaches (were) the same way — ‘You know, that’s how I felt. I just didn’t quite know how to say it,’” Watson said. According to Watson, he chose to write the post after he realized the deep roots of the issue of racism. Instead of facing racism with societal and traditional means, however, Watson explained that people in the U.S. must address the root of the problem. And according to Watson, the only cure for the disease is found in the center of the gospel.